Don't miss your chance to get a cheaper Sonos One speaker or two. Update: stock is somehow still available once again at this super low price. It had a bit of a wobble at the weekend, but it seems all options are back on the table for these mega cheap Sonos One deals. The Sonos One smart speaker has become one of the most popular speakers over the last 12 months and demand stepped up a notch recently as the stylish soundbox has made its way on to plenty of Christmas wishlists. Which is why we're super stoked to see this late discount arrive to knock a decent amount from the RRP. So if you missed out on any Black Friday offers, don't worry as there's still time to save a cool wedge of cash. We regularly keep our eye on the full range of Sonos deals and these one are very tempting. Kicking things off in the USA, you can save $20 on a black or white Sonos One speaker over at Walmart. Or if you're ready to double down, there's a $50 discount on pair of them at Walmart too. Looking to pick up a cheap Sonos One in the UK? We've got you covered there too with a £20 discount at Amazon. Not to be outdone by the Stateside offer, there's a £50 discount available too if you opt for two Sonos One speakers instead. 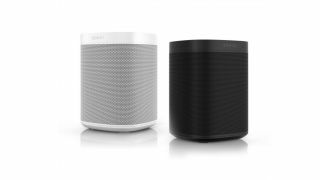 If you're going for a pair of Sonos One speakers, you can choose black, white or one of each for your bundle. We rarely see this with discounted bundles to be honest, more often than not you're forced to pair up two of the same colour. If these Sonos prices are a bit steep though, other smart speakers are available for much less. Take a look at our guide for Amazon Echo deals or Google Home prices for some alternative options. If audio quality is key for you though, then these Sonos options may be better for you.